Your candidate data can give visibility into what’s working or not working with your hiring process. This valuable insight can help focus your acquisition strategy and your team. With many moving parts, it can be a challenge to clearly understand where to invest next to improve how well you can attract, progress and hire quality candidates. And while there is a ton of data available this isn’t always at the right level to inform decisions. A deeper look at your candidate data can deliver visibility into the effectiveness of your efforts. This valuable insight can tell you where to focus attention and investment to deliver timely, predictable, highquality hires to the business. So, you get it, analytics can help. Now, how can you get started when your team already seems maxed with their daily activities and you are cringing when you think of the state of some of your data? Remember, analytics are a journey. The key to get started is to jump in – with a goal in mind. Where are you struggling to attract, progress, and hire quality candidates as quickly as your business needs? Do you see a large pool of candidates for some roles – and yet you can’t seem to find candidates that fit the interview criteria? Are some roles staying open a lot longer than expected in some geographies yet filling quickly in others? Do you know which recruiting sources are providing the highest-quality candidates? If you are looking to improve your ability to progress a quality applicant to close, candidate pipeline analytics can help. These analytics will examine how candidates progress through the various recruiting stages, highlighting what’s working – and what’s not - through the process. This gives you the ability to focus on addressing bottlenecks and identify best practices that can be applied to other areas. While candidate pipeline analytics may be a new approach in recruiting, these analytics have been proven to be effective for sales and marketing teams. Sales and marketing teams often struggle with finding those high quality leads – and progressing them efficiently to close the deal. They use pipeline analytics to give the visibility to know where they are being effective – and ultimately if they are progressing fast enough to meet their business objectives. Candidate pipeline analytics provide the same type of insight – focused instead on your candidate pool and the ability to move the high-quality candidates to hire. At the core of candidate analytics are two key metrics: volume and conversion rates. 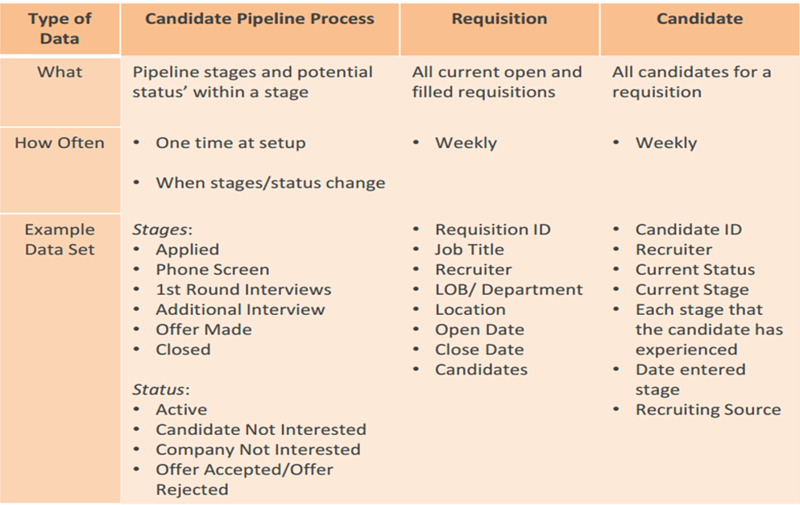 When analyzing your pipeline, a primary consideration is the conversion rate - how well are you doing at converting candidates from initial application to the various stages? How well are you doing at converting from one stage to another? Knowing your bottlenecks and where you have high drop off rates tells you where to focus to improve. At the same time, you have a certain number of roles to fill so you also have to consider quality. Is your candidate pool large enough to deliver the number of quality hires required? Start-to-Stage Analytics: What is the quality of the candidate pool? For all of those who are identified as potential candidates, what volume and percentage are considered quality – and eventually become hires? 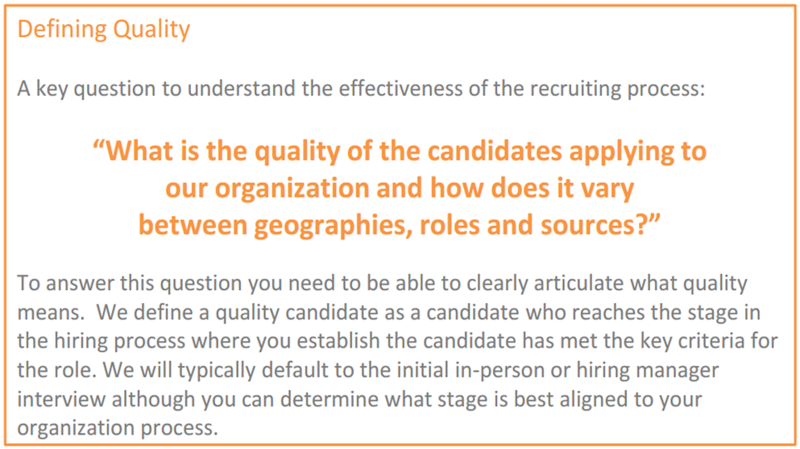 This can help you determine if you have the right sourcing strategy overall and for specific roles, geographies or recruiting channels. 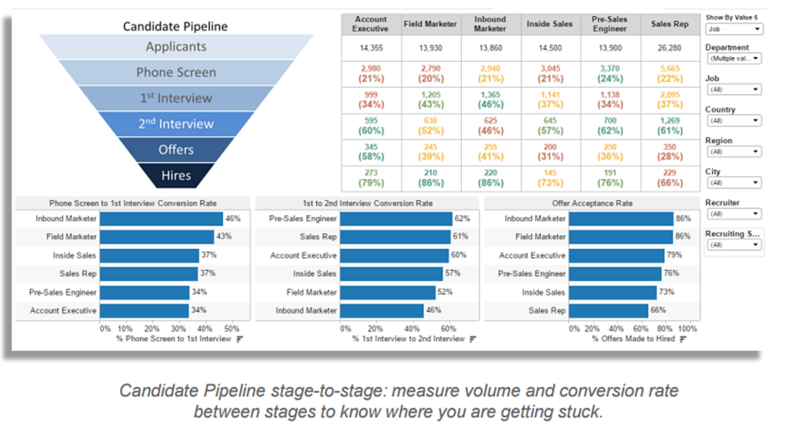 Stage-to-Stage Analytics: How well are you progressing candidates through the pipeline? In this case, you are focusing on your ability to convert from one stage to another. This will help you quickly identify where you are having challenges in progressing candidates. 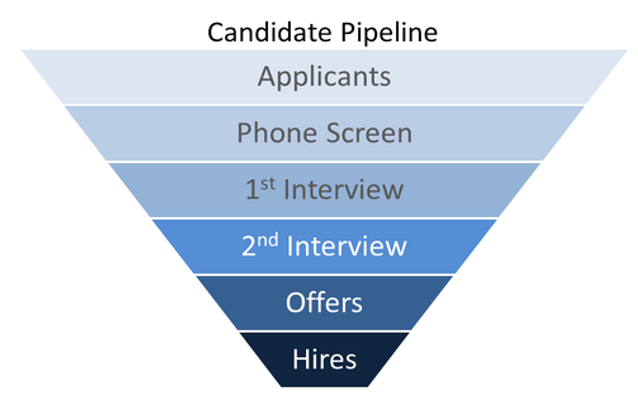 For example, there is a high percentage of candidates converting from phone screen to 1st round interview. There is then a low percentage getting to 2nd round interview. This suggests there is an issue with the criteria to screen candidates for interviews. While your overall volumes and conversion rates will provide a high level view of where focus is required, it will not give you enough information to know what to do next. You need to be able to analyze the results on various criteria. What roles are more challenging than others to fill? What locations are struggling to get an adequate candidate pool? Which recruiters are doing the best job at screening the quality candidates? This context is important to create the action plan and drive change. To determine which analytics and segments matter most depends on your business priorities. For example, if you are growing fast and need to quickly expand the number of quality candidates, you will want to start with a focus on start-to-stage and segmenting by roles that are the focus for growth. You can then use stage-to-stage to make sure progression is occurring as expected. By ensuring the tie back to business priorities, you then determine the scope of the data needed for the analytics. If you are cringing when we mention data, take a quick step back to understand what data is actually needed in order to do the analytics. To be able to use candidate analytics, the focus needs to be on collecting the data required to analyze the stages and segments that are important to your business. If cleanup is required, focus on the key segments first and gradually move to the next step. There are three types of data required to be able to analyze the volume and conversion rates in your candidate pipeline: candidate pipeline process data, requisition data, and candidate data. This is the baseline data required to build the baseline set of analytics to drive insight into how well you attract, progress and hire quality candidates. Once you review and share the initial results, you will likely want to further refine the analytic views to tailor to your needs. Are there specific views/filters that need to be added to support your business process? Are there questions that came up as you shared the results that need additional views? Often we see questions evolve quickly after seeing the results for the first time. With this foundation in place, refining the results to segment by a new area or add a new analytic view can also occur very quickly. With the analytic foundation, there is also an opportunity to tackle the next business priority or take the analytics to the next level – tying candidate information to employee progression. This is where we can take the analysis beyond the quality candidate to look at candidate characteristics in a quality hire. For example, what are the recruiting sources for your high performing employees? In future how-to-guides we will dig into the analytics and data required to drive quality analysis from candidate to hire. Getting started with candidate analytics can be daunting – with lots of data and no time to dive in to figure out how to use it effectively to improve your ability to attract, progress and hire quality candidates. Using a three step process prioritized by key business questions ensures you can get started quickly and evolve over time. Need a hand? Send us an email - we’ll walk you through a no-pressure demo of Candidate Pipeline Analytics. Candidate Pipeline Analytics are a powerful asset – to focus your evolving talent acquisition strategy, adapt your recruiting process, and communicate with the business.